As we recently announced, we have partnered with Alderac Entertainment Group to meld the fantastic Love Letter and Munchkin juggernaut into a single treasure-snatching card game that you will want in your pocket: Munchkin Loot Letter is on the way! I've gotta say that everyone on both teams really came together on this one. I'm proud of how our crew stepped up and dove right in, helping the guys at AEG make this twisted blend of games something completely new and fun. Love Letter is a blast. Really! Small, portable, plays fast, and great for those non-gaming relatives. Loot Letter has new John Kovalic artwork! When Steve played the game with our staff, I could hear the laughter in my office. With the door closed. And my music cranked. There's a new Munchkin game card packed in the box, created especially for this set. 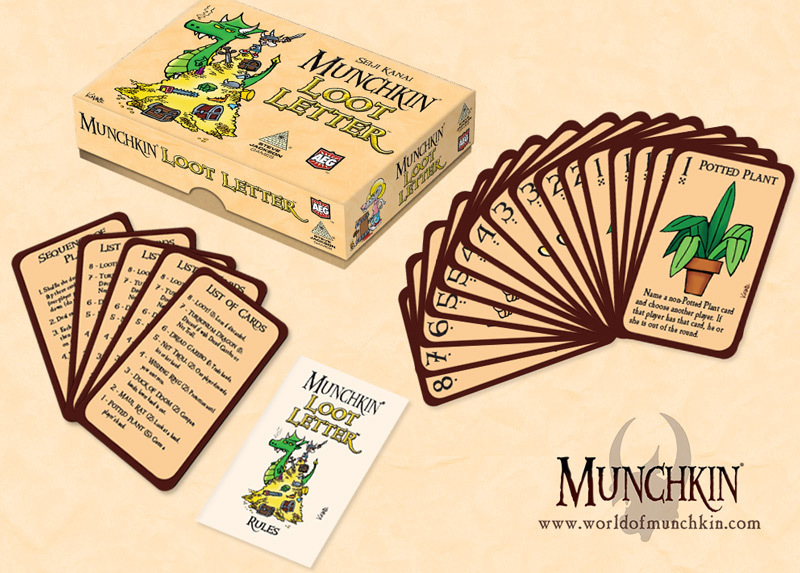 Munchkin Loot Letter is expected in stores this fall, and at just $10.99 it's a very inexpensive buy for a hell of a fun game.